The retreat and its 31 secluded lakefront acres is situated in one of the most picturesque and visited areas of the central United States. But don’t let that worry you. You’re off the beaten trail, once you turn off Highway 86 and take Washington Road a little over a mile to your driveway. There, it’s as if tourism isn’t even happening. I won’t tell you much about the lake itself in this segment. You can learn the story and statistics about Table Rock Lake by clicking the “Lake” link above. It has almost 800 miles of shoreline, is noted for its scenery, fishing, and recreational offerings. It’s puzzling that so little is known about this area in New York and Los Angeles, because its appeal to people in the middle of the county is monumental. 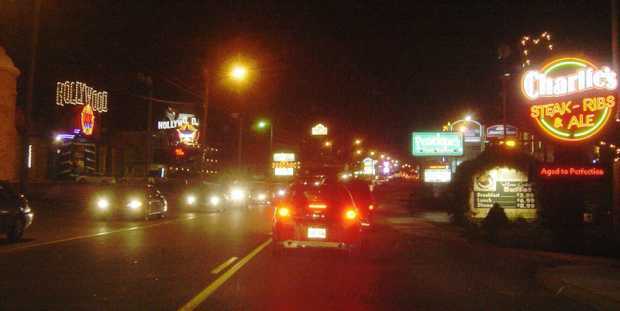 Many people come here because of Branson, Missouri (about 30 miles from the property). There you’ll find over 50 theaters, with the majority specializing in country music. But other shows offer everything from 1950s and 1960s music to magic shows, river dancing, and comedy. Don’t expect anything edgy, though. Branson is family oriented, although I’d estimate the average age of the audience is around 60. In fact, when I first moved here at age 58, I was frequently among the young segment of those in attendance. Maybe my observation isn’t scientific, but there it is, for whatever it’s worth. Even odder, several years ago, I attended as Chuck Berry performed in Branson at age 80-plus, and it was the youngest audience I’ve seen there. Yes, he could still rock! For kids, there are water parks, miniature golf, a world-class theme park called Silver Dollar City, and a lot more. Lake Taneycomo, linking Table Rock Lake with also-massive Bull Shoals lake, runs like a wide river right through Branson. Before I started researching my property purchase on Table Rock Lake in 2002, I was only vaguely familiar with Branson, Missouri. I knew its association with country music, but I didn’t grasp its importance or that it offered other kinds of family-oriented entertainment, too. Here you’ll find over 50 theaters, restaurants, an upscale lakeside mall called Branson Landing, a world-class theme park named Silver Dollar City, and much more. Although Branson isn’t an everyday topic in California, where I lived, it is a central destination from many states in this central region of America. But Branson is just part of the lure in this tourist destination where the property itself rests oddly secluded nearby. Also, there’s the quaint town of Eureka Springs, Arkansas, Big Cedar resort, Silver Dollar City (the theme park that I mentioned above), many haunting caves, War Eagle Mill, Bass Pro’s gigantic store in Springfield (yes, it’s really a tourist attraction), four major lakes, national forests, and more. If you wake up in the morning and crave an experience that’s completely different from Branson, just turn right, instead of left, on the highway a mile from your driveway. That will take you along a stunningly scenic drive that, 22 miles later, puts you in Eureka Springs, Arkansas. This was one of my earliest discoveries in the Ozarks. It’s clearly an unexpected change of pace. 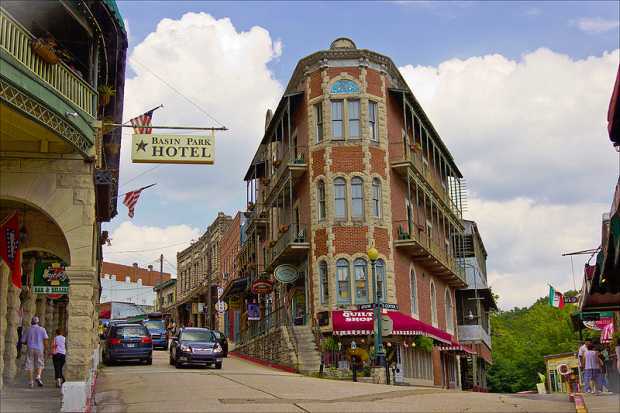 Many of the buildings in Eureka Springs are from the late 1800s — authentic and preserved. There are quaint shops, plenty of great restaurants, and a counter-culture of artists and writers. Many people come to get married here. There are meticulously maintained Victorian houses, “healing” springs, 125-year-old hotels (including the famous Crescent Hotel), and a lot of other offerings. You can take horse-drawn carriage tours of the surroundings. And there’s even the gorgeous city-managed Lake Leatherwood, where you can picnic or rent a paddle boat. Less than a half hour away, the Ozarks gets turned upside down in Eureka Springs, Arkansas. It’s an island of culture and counterculture, with upscale shops and memorable restaurants. Many of the hotels, houses, gathering places, and storefronts date from the 1800s. You’ll come alive here. It’s kind of the reverse of Branson, which appeals mainly to the country music crowd (and I, oddly, have become one of them). Eureka Springs is more grown up and less of a specific family vacation spot than Branson. The property is right between those two tourist destinations, so you can choose to turn left or right at the highway to choose a destination that fits your mood that day. Be sure to visit the Crescent Hotel on a winding road up a hill. It has a storied past, has an amazing restaurant with the same 1880s decor as it had originally. Photo source: Wikimedia. Photo credit: Doug Wertman. The hundred-year-old city auditorium often schedules premier touring entertainment. I once watched a midnight showing of Rocky Horror Picture Show here on Halloween. Unfortunately, the local kids didn’t quite have their semi-required audience-participation routines up to Los Angeles standards. But they tried enthusiastically. At the bottom of this page is a link to help you understand Eureka Springs. The “what else” part of describing this area could continue for a very long time. Let me just summarize and provide some selected links at the bottom of the page. Table Rock Lake, where the property shares over 1,000 feet of shoreline, is a major attraction in itself. Seven miles away is Dogwood Canyon, a quiet park hidden between hills, where you can walk, sit, read, bicycle, horseback ride, or fish for trout. Big Cedar lodge is only 20 minutes away, and its enormous surroundings are breathtaking enough to take special out-of-town guests to enjoy the first-class restaurants. If you like to tour caves, they’re everywhere — in fact, some of the premier caves in America are within a few miles. Besides Table Rock Lake, there’s Beaver Lake, Lake Taneycomo, and Bull Shoals Lake, all less than an hour away. Although I told you I would try to share my positive and negative impressions, there’s really not much negative to say about the area itself. You’ll find new things to do and explore anytime you choose. I hadn’t counted on there being so many half-day excursions nearby. I’m still discovering new ones. The things you might find negative, depending on your outlook, are an overwhelming emphasis on country music, guns sold everywhere, more winding two-lane highways than you’re probably used to, a tendency to close most shops and restaurants hours earlier than seems appropriate, zoning that leaves poorly maintained trailer homes near upscale dwellings in some places (but not near the property), and a sometimes annoyingly unhurried lifestyle. I probably could add to that list, but it would still be much shorter than one I could make of my big-city grievances. You’ll find more pictures of area attractions by clicking “Photos” in the top or bottom menu. In short, this area far surpassed what I was hoping to find. But it might not be the right one for you. I sometimes miss the convenience of big city life that used to be minutes away. But, for me, that’s a small sacrifice. Don’t mention the negatives you dolt! !